A few weeks ago I started a comic strip called “Big Schtick.” It was more like me venting ideas about running. However, I changed directions when I saw this would get old pretty soon. Within a few days I penciled together a cast of 5 characters, of whom I know little, not even what they look like exactly, even less how they act and reaction to situations. 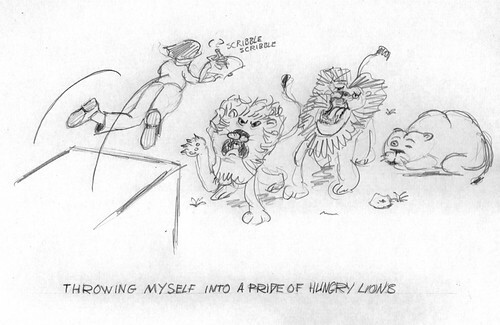 It feels like throwing myself into a pit filled with hungry lions who didn’t have anything to eat for weeks and weeks. Not good. I will muddle through, but let that be a lesson to you (and myself) to do a test run of your web comic before publishing it. On the other hand, I would never have started this comic if I kept waiting for things to click. I guess I’m someone who needs trial by fire to get off his lazy behind and actually do something. Like creating a web comic. I agree Rene’! I’m thinking of starting a webcomic myself and as it gets more and more developed in my head i find more and more ideas i feel i must work out before i start. A couple weeks into thinking about it and im already about ready to quit before ive even began. The other temptation is to just sort of start in beta (as you put it) and see if I sink or swim. I think I may do just that. I guess it’s more ok to publish half baked stuff starting out than it used to be. I guess people like to see the struggles and victories. My problem is that I often sink. You’re suppose to learn from the experience, but I keep forgetting what I learned the last time. I must have cheese for brains, Swiss cheese. Well I think you can keep it going based on “slice of life” running experiences or “borrow” from other runners experiences too. But I think that it is good to have at least a months worth of strips ready to go before you publish your first one. You then might have a feeling if you want to do another 6! My particular problem was that I wasn’t going to do this comic, because I wasn’t sure I was up to it. Now I know I’m not, I’m going to muddle through anyway.